I’ve been following a fantastic blog for a couple weeks. Grover Cleveland — his real name — writes “Camera and Pencil in the Mountains” that details his travels in the Sierra Nevada range. 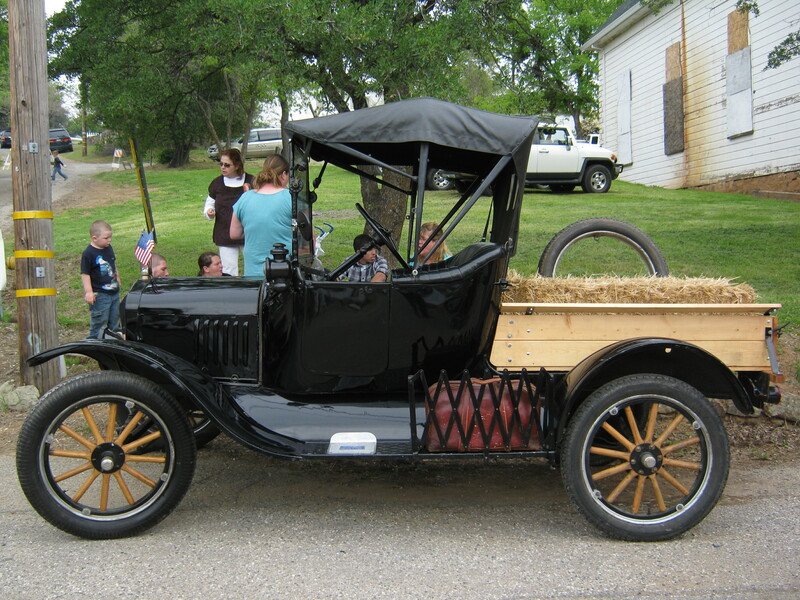 Last year he bought a 1919 Model T Ford roadster and converted it into a pickup truck. He’s hoping to follow a good portion for the Lincoln Highway centennial in 2013. Click the images here to see Grover’s large originals. Then follow his adventures at sierratraveler.wordpress.com/. How many of you got to visit at least part of the Lincoln Highway Buy-Way event this past weekend? Write and tell us about it!! Mike Hocker, executive director of the Ohio Lincoln Highway Historic Byway and director of that state’s Buy-Way event, sent the following article that shows the struggle over routing the LH. Nancy Everly actually found the article in the The Crestline Advocate, July 10, 1919, while researching her forthcoming book on Leesville, and Nancy Hocker transcribed it. From Bucyrus west to Oceola and Nevada the residents of the county are having much ado about the route of the Lincoln Highway. The original route of the Highway was to go from Bucyrus to Upper Sandusky through Nevada but the Crawford county improvement has gone by was of Oceola, which seems to be a straighter road. As a national advertisement the Lincoln Highway is considerable institution but in reality it cannot be considered seriously. As it is laid out at present it will never be a monument to good road building. For instance, Wayne County is now closing the gap by improving the Highway from the present end of the brick road five miles west of Wooster to the Ashland county line. In order to do this the Highway leaves the main east and west road about six miles west of Wooster and takes a crooked and circuitous route over through Ashland and then back to Mansfield. No one will ever be able to give a good reason for such a route when the Highway could be laid out over the straight road from Wooster to Mansfield, a safer, prettier and shorter route.’ Coming into Mansfield on Fourth street the Highway takes a snake like course through that city and thence by way of a longer and more dangerous route through Richland and Crawford counties and another snake-like route through the city of Bucyrus. If the Highway is really supposed to be the most direct route from coast to coast it would leave Mansfield on Fourth street, the same street on which it enters, proceed right west to Bucyrus on a straight line and enter the latter city on the same street by which it leaves, Mansfield street. An improved road from coast to coast by the shortest and most direct route through the country would stand forever as a monument to the cause of good roads – an incentive for all time to active construction and maintenance of better roads. But the Lincoln Highway does not fulfill this mission and it will never be the great institution which good roads enthusiasts from coast to coast hoped it would be. The Lincoln Highway board in Nevada has received notice from the Lincoln Highway Association to put up markers and detour signs along the old Nevada road from Bucyrus to Nevada. The signs are being put up. 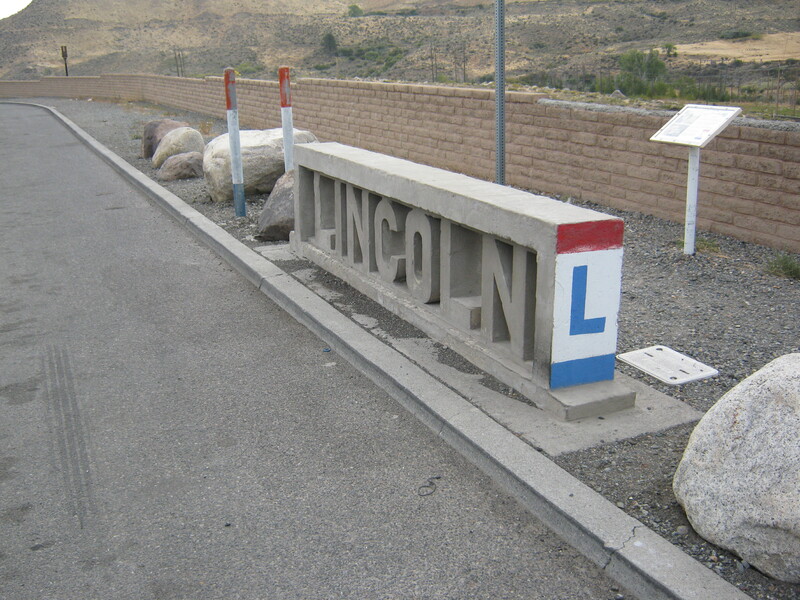 In the word which was sent to the Nevada board, it was stated that the signs would be necessary to accommodate the United States government motor transport corps which is scheduled to come through over the Lincoln Highway. The motor transport corps left Washington and is scheduled to stop over in Bucyrus, making this a night stop about the 16th or 17th of this month. As the route was originally laid out over the Nevada-Bucyrus and not the Oceola-Bucyrus road, this letter is taken to indicate that there is no question that it will be the official route. The change was asked for by parties desiring it to go over the Oceola road, it was stated. A. F. Bennett, vice president of the Lincoln Highway Association, in a letter to the Nevada board, says: “It is distinctly against the policy of the association to make a change in the route of the Lincoln Highway. The army engineers in connection with the routing of the trans-continental motor convoy through Ohio requested that the route of the Lincoln Highway be removed from Forest, Dunkirk, Ada and Lima, to the route following directly west from Upper Sandusky through Williamstown and Beaver Dam and West Cairo to a junction with the Lincoln Highway west of Gomer. The directors of the Lincoln Highway Association have authorized this change. Consul Pontius of Upper Sandusky has removed the signs to the new route as instructed. The Nevada board plans to place the signs as requested to enter Nevada over the old route of the Lincoln Highway. The retracing of the 1919 military convoy route made headlines at it crossed the U.S. the past month. The tour commemorated the 90th anniversary of the first transcontinental U.S. Army motor transport convoy, most of it along the Lincoln Highway. Some of the participants also posted updates. Marilyn Boots reported on her travels with Dennis in “Jezebel,” a Vietnam-era jeep that he restored. Dennis is a former Army captain who served with the combat engineers, with one tour of duty in Vietnam. Their blog is bootsadventure.blogspot.com/ (also the source for these photos). He was maintenance officer for the convoy so his Jeep brought up the rear of the convoy. Marilyn was “chase lead,” responsible for seeing that civilian vehicles carrying family members of convoy participants stay on schedule. Wow! The journey had been incredible so far and extremely busy. I just thought I could blog every evening! We’ve start with breakfasts at 6:30 and have not reached our hotel rooms until after 10 each night. Today is our first rest day, so I want to share some highlights. We are so filled up with memories already that we could stop now and be content. WE MADE IT!!! We all arrived safe and with NO BREAKDOWNS about 1:30 p.m. Wednesday at the Western Terminus of the Lincoln Highway on the edge of San Francisco, which overlooks the Pacific Ocean to the west and the Golden Gate Bridge to the east…. We have never been so grateful for police escorts! There were 32 motorcycle policemen helping us through the enormous amount of traffic over the Bay Bridge and through the hills of San Francisco…. Again, we were cheered on by waving crowds and lots of picture taking as we made the final climb to our destination. Drive through McConnellsburg 8:30 am. Old Bedford Village about 11 am – 2 pm. Parade through Everett, Bedford, and Schellsburg. Onto Somerset County and Flight 93 National Memorial. Stop in Stoystown about 4:30; Main Street will be closed and a brief ceremony is planned at the Hite House. Arrive at Westmoreland Mall in Greensburg about 6 pm, where there will be a display depicting the historical significance of the 1919 convoy. NOTE: times are subject to change — and like the original convoy, I think that celebrations and traffic will constantly put them behind schedule. The re-creation of the 1919 trip across the country of the U.S. Army Transcontinental Motor Convoy is making the news as the event approaches. Papers such as the Clinton, Iowa, Herald are reporting lately on the convoy’s passing through their areas. The original convoy is perhaps best remembered today for including young Dwight Eisenhower. Sponsored by the Military Vehicle Preservation Association, up to 150 military vehicles will retrace the convoy’s itinerary, which followed the Lincoln Highway for most of its route west of Gettysburg, Pennsylvania. This 26-day convoy will depart from Washington D.C. on June 13 and arrive in San Francisco on July 8, crossing all or part of 11 states. For more information visit www.mvpa.org and click the 2009 Convoy button on the left. Click HERE for the complete schedule of stops. Also, the new Indiana LHA brochure includes not only a map of the Lincoln Highway but a description and map of the convoy trip. Visit www.indianalincolnhighway.com to request one. Next summer, the Military Vehicle Preservation Association will recreate the 1919 Transcontinental Motor Convoy, a grueling trip perhaps best known for including young Dwight Eisenhower. The Lincoln Highway Association is working with the group, and one of the stops will be the 2009 LHA conference in South Bend, Indiana—arriving on Thursday, June 18, and joining an LHA parade on Friday. 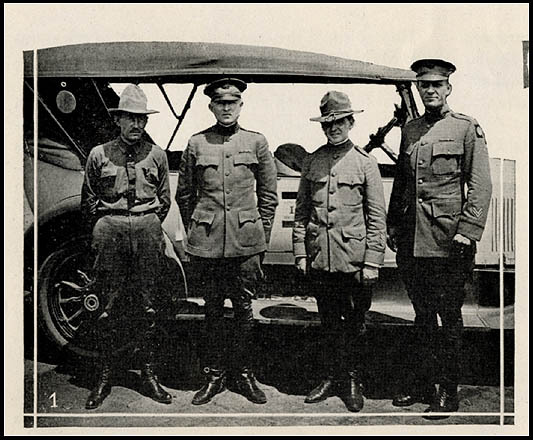 In 1919, the US Army’s Military Transportation Corps (MTC) undertook a transcontinental Convoy to demonstrate the need for a mechanized Army. This “hooves to wheels” plan to modernize America’s fighting force needed an attention-getting event to energize Congress and the citizenry, and parading the Army’s military might from coast-to-coast along the new Lincoln Highway was a great way to get demonstrate new vehicles. As part of its mission to honor our country’s military vehicle history, the MVPA has decided to recreate the famous 1919 convoy in 2009 as a 90th Anniversary celebration of the achievement and in conjunction with the nation’s President Lincoln Bicentennial celebration. Click HERE for a PDF of the MVPA’s log of the route and overnight stops. Craig Harmon continues researching the 1919 Transcontinental Motor Convoy, which followed the Lincoln Highway for much its course across the U.S. Some of his work lately has focused on the Reverend Samuel Myrtle Johnson, a preacher who combined religion and patriotism, especially when it came to support for Good Roads. Along with being the official speaker for the convoy, Johnson conceived the Zero Milestone in Washington D.C. and was director of the Lee Highway Association (which, like the Lincoln Highway, also connected New York to San Francisco). 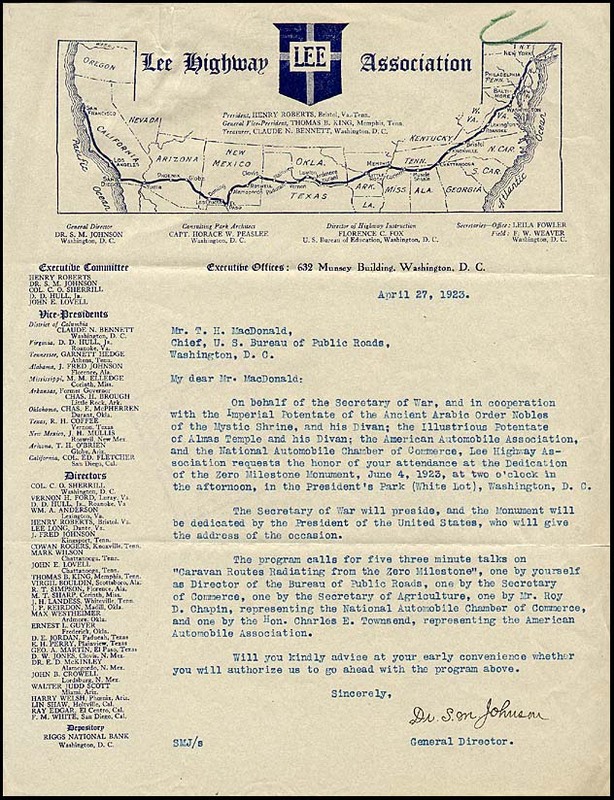 The image above shows Johnson’s invitation (on Lee Highway letterhead) to U.S. Bureau of Public Roads Chief T.H. MacDonald to attend the dedication of the Zero Milestone, the launching point for the convoy. He was also being reminded that he would talk for 3 minutes about the routes that radiated from the marker. 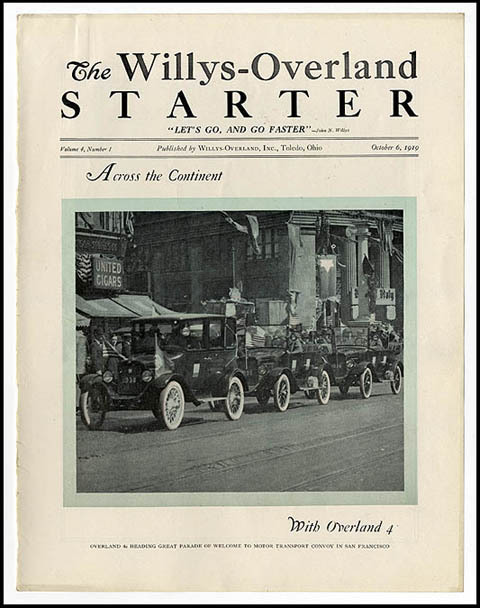 Much of the new info came from an 8-page article in the October 6, 1919 issue of The Willys-Overland Starter. On the cover, you can see three cars donated by the Willys Overland Company for use with the convoy: Dr. Johnson traveled in the covered sedan followed by two open-top Willys-Overland 4s used by Army Publicity Officer Lt. William B. Doron and official photographer Sergeant George Lacey. A fourth car was an 88-4 Willys-Knight that was used as the pilot car by LHA vice-president H.C. Osterman, who traveled several days ahead. The article includes the only known photo (below) of Osterman, Doron, Train Commander Captain Bernard S. McMahan, and Expeditionary Commander Lt. Col. Charles W. McClure. Click Here to download the 5 mb article at 150 dpi. And see my previous post on Harmon’s convoy research here. In 1919, the Transcontinental Motor Convoy crossed the U.S. to test the mobility of the military during wartime. It is perhaps more famous for a Lieutenant Colonel who decades later would become President Dwight Eisenhower. Twenty-four officers and 258 enlisted men took 81 motorized Army vehicles from Washington, D.C. to Gettysburg, and then followed much of the Lincoln Highway to San Francisco, arriving 62 days later. So much for mobility! Lincoln and Lincoln Highway researcher Craig Harmon has lately been on the trail of primary sources from the convoy; below are just two of the many revealing documents Harmon has unearthed – another one about camp sanitation is especially intriguing! They add invaluable information to the tale of that cross-country trip. See his website for more information, or ask there to be added to his email updates. Above, this report runs 35 pages and includes 20 b/w photos. Below, notice the official letterhead! Click on the image below from the Dwight D. Eisenhower Presidential Library & Museum, Abilene, Kansas, to visit its page about the convoy.